Top 3 Places to Find Beading Inspiration. Way back in 2008 (way back? ), Michelle Mach wrote this great blog about places to look for inspiration when you feel as though the well has gone dry. And really, I loved every single word of this blog: beaders are tactile people. We are inspired just as much by our other four senses as we are by the sight of colors and shapes and lines. Am I right? Beading itself is such a wonderful sensory experience as we slow down long enough to notice the sensations of the needle and thread in our fingers, and the feel of the beads as we weave with them. Why not let that serve as a source of inspiration for your next beading project? Finding Inspiration From Your Favorite Jewelry Designers. I love collecting handmade art beads and handmade jewelry-making components, mainly because they serve as such a wonderful source of inspiration for me! (Either that, or I just like to shop for beads. But who doesn't?) Looking at what another artist has done to create a bead, button, pendant, or cabochon is sometimes all I need to send me to my bead stash to search for coordinating seed beads, crystals, pearls, and glass beads. I've always said that I loved creating with handmade artist beads and components because of the creative cooperation. And when you look to other designers of finished jewelry as a source of inspiration, you might find yourself surprised at what shows up on your bead tray. Favorite Sources of Inspiration From Your Favorite Bead Artists. 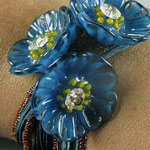 Another way to find new sources of inspiration is to ask the pros: these are the artists who design and bead every day, and who know how to follow their passion for creating great beaded jewelry designs. Remember that each of us is a unique human being with our own unique perspectives, talents, and abilities. Everyone is going to have a different way of looking at the world, and that's a good thing that we should share through our beaded creations, don't you think? Because I'm relatively close to New York City (four hours away by car and train, yet it feels like a whole different world!) and Montreal, I have access to some pretty spectacular sources of inspiration in the numerous galleries and museums. The Metropolitan Museum of Art has long been a favorite place for me to find inspiration from other great artists. If you're interested in learning more about how to use fine art like paintings, sculpture, or even decorative arts and architecture to glean inspiration for your next beading projects, you won't want to miss our next live online education event: Beadwork Inspired by Art with Jean Campbell. 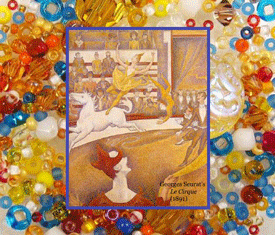 Jean will take you through the process of finding art that speaks to your soul, then shows you how to raid your stash for the right beads and materials to turn your inspiration into finished beaded jewelry. This live webinar will take place on Tuesday, September 30 at 1 p.m. EDT, but don't worry if you can't attend — register now, and you'll be among the first to receive a downloadable archive of the webinar, including all the questions asked by participants, 2-3 business days after the live event. 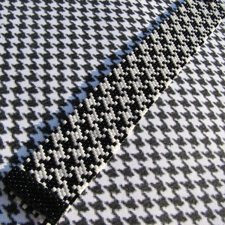 You'll also receive a free beading pattern for one of Jean's bracelets, inspired by a work of art. Register now for Beadwork Inspired by Art with Jean Campbell and find out how to draw on centuries of art history to create beautifully modern beaded jewelry designs!